Anyone saw the above illustration? 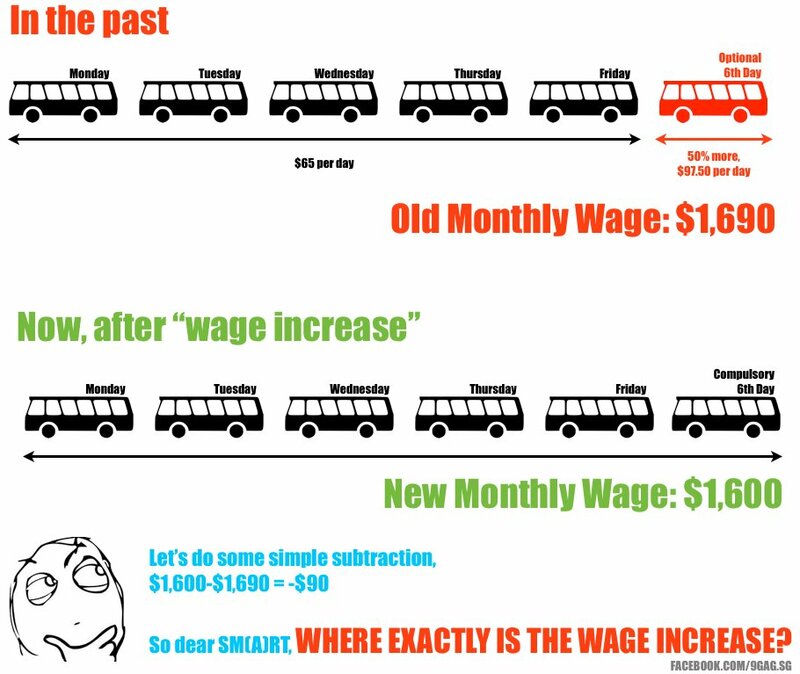 – There have been media reports that while SMRT bus drivers will have a $225 increase in basic salaries (for Singaporeans), they will have to work 5 to 6 days. And somehow actual salaries after taking into account overtime will actually drop. – Yes, working arrangement has indeed moved from a 5 day to 6 day week, but at the same time, working hours per day will be reduced, from 8.8 to 7.3 hours. – With shorter working hours every day under a 6 day week, drivers now accumulate overtime every day, instead of only on the 6th day. With a higher basic wage, the overtime rate per hour will go up, further boosting their pay. Below is a simple example to illustrate. An excerpt from ST quotes Ong Ye Kung, Executive Secretary of NTWU: “Both public transport operators have been in this line a long time. I trust that by now they understand that in bus driving, you should never fill all vacancies. Instead, leave some vacancies, so that there is always overtime for bus drivers. If for some reason new managers forget this, the union will remind them in very clear terms,’ he said in response to the overtime concerns of the bus drivers. The following are comments from reader “Deegroom”, he says “Well, i am wondering since they can shave 1.5 hrs off every workday and and make you work an extra day a week. Why can’t they just raise the pay and not mess around with the workdays per week. All of us know that its more siong to work a 6 day week (7.3hrs) than 5 days (8.8hrs). Working that extra day will just eat into your time with family or rest time.”I must admit, I did leave out the section on why SMRT changed the work days to 6 days. According to their press release, the SMRT wanted to keep up with standards in the service industry: that is to provide service 7 days a week (which makes sense anyway). By reducing the number of hours they work each week and increasing their salaries, they solve two problems: wages and lack of manpower.It is not as if a 6 day week is something new for SBST. According to their comments “SBST bus drivers have always been on 6 day week. 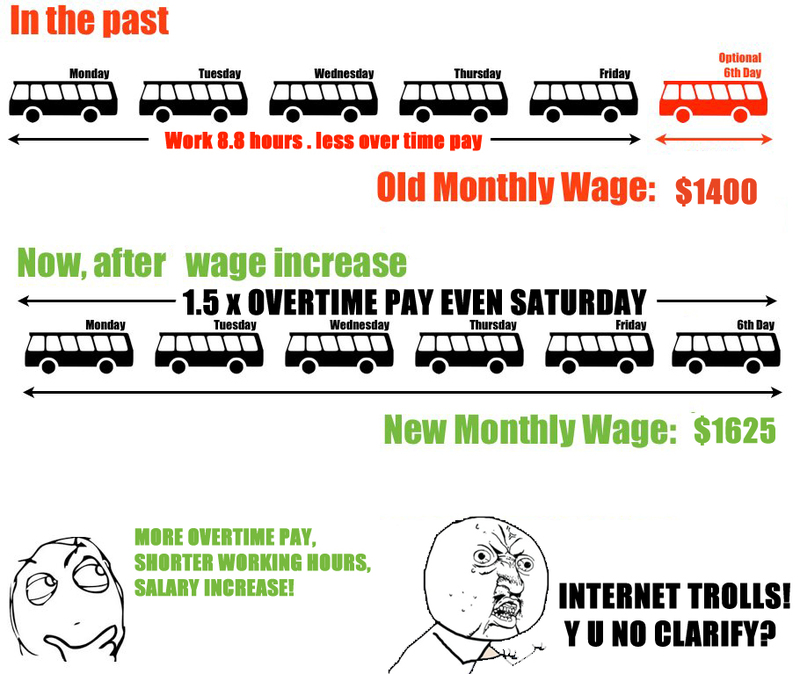 So are the bus drivers from TIBS and later SMRT, until recently in 2006 when they were switched to a 5 day week.”If you think about it, the easy way out for the SMRT would be: to hire foreign labor to makeup for the loss, but that’s not going to go down well with the public. So here’s a new illustration for you to share! The way you put this it does seem that workers end up walking away with a better deal since the end up working the same hours for their basic pay yet have more flexibility to work for overtime pay to supplement their income. SO More Money = Better life for the worker? On the surface it would seem so if the worker’s quality of life is only dependant on the amount of money he makes. By implementing a 6 day work week, the worker has a shorter continuous period of rest during his off period. A longer continuous period of rest allows for greater flexibility in recreational arrangements with family (or alone). Eg. Weekends away, planning for a party etc. Also consider that say a worker takes a certain amount of time daily to prepare for work, and another fixed amount of time for commute (assuming that commute can be consistent, but these days, that is less certain). This comes out of the individual’s personal hours. So instead of 5x spent on prep and commute the worker now spends 6x per week? Has anyone also considered why the increment was not retained, while still retaining the previous 5 day work week (with an optional OT day) while still allowing workers to accumulate OT daily? We are all aware that the transport company in partnership with the government are dropping some serious money to increase the bus capacity. More buses = more drivers. You have to get the hours from somewhere. A shorter workday 7.3 vs 8.8 allows more room for the driver to chalk up OT before fatigue (regulated or otherwise) prevents him from doing so. So the driver may still end up working 8.8 hours (or more since OT can be accumulated daily). He earns more money (Great!) but he may be less aware that he is sacrificing family/personal time. This would affect his personal and social health. So individual bus drivers may in fact work longer hours that the 44hrs (+10hrs OT as per the author’s example). We are all chasing that money to make ends meet. But we barely stop to consider the ramifications of longer work hours. Well, it is hard to argue with work-life balance. Honestly? I’m not going to work a 6 day week. But that’s what a free market is about. That’s why it’s so important to have a large variety of jobs in the market: that’s why it is so important to attract investors, businesses and encourage entrepreneurship to create the many kinds of jobs that is needed. If a driver is really disgruntled, I believe he can speak with management for an alternative arrangement. In the unlikely event he is refused, a robust and lively job market will provide him opportunity to do something else.